Abstract: The history of Long Island embodies what public funding contributes to transportation infrastructure. The article contextualizes the Long Island Rail Road in American railroad history both as a private company and public service. 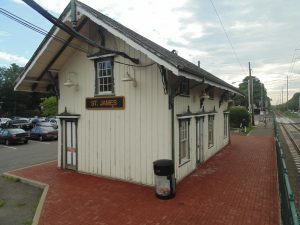 Using the Port Jefferson branch as an example, it argues that state proprietorship was essential for modernization and that recent improvements proved to be a poor investment. Like other American railroads, the Long Island Rail Road (LIRR) was at an impasse by the mid-twentieth century. Since rail was no longer the preferred method of transportation, many private railroads faltered and were forced into bankruptcy, unable to fund operating costs and essential improvements. Ultimately, public management set railroads on the right track since private companies alone could not raise sufficient capital. With government aid, antiquated rail systems were modernized to provide safe and reliable service. Since it served one of the fastest growing suburbs in the country, the LIRR’s survival was crucial to the island’s future. In the 1960s, New York State took action and created an agency to finance improvements and oversee operation. Although it was a special case commuter company in a defined region, the LIRR was the harbinger of federal intervention in the 1970s. Congress also created an agency to oversee the national rail system. This article contextualizes the LIRR’s importance in American railroad history. Using the railroad’s Port Jefferson branch as an example, it argues that state intervention in the 1960s successfully modernized service. On the other hand, state-authorized improvements in the late twentieth century did not. Rather than provide efficient and reliable service the railroad sought an economic alternative that turned into a poor investment. To place the LIRR in a national context, it is important to review the history of American railroading. Railroads altered economic and social life, creating huge economic empires in the Industrial Revolution. Passenger trains were luxurious endeavors where customers were treated to premier amenities in palatial coaches. However, in the mid-1950s patronage fell. Americans began to favor the automobile and airplane for travel needs. For example, New York Central Railroad ridership dropped forty percent within months of the parallel New York State Thruway opening in 1955. Rail freight shipment also fell out of favor after the introduction of trucking. The American railroad system was at a crossroads and needed guidance. Both passenger and freight operations were losing money, and rail infrastructure and rolling stock was out-of-date. Since their rate of return was too low to borrow, railroads attempted to make capital improvement out of earnings. However, private investment alone was not enough. Modus operandi was that if the deficit of passenger operation was as high as fifty percent the company was to fail. One of the only railroads that came close to breaking even on passenger traffic in the mid-twentieth century was the Long Island. While it didn’t have enough to capitally invest, it served a high-density, commuter area that warranted modern operation. The island, particularly Nassau County, expanded dramatically in the postwar years. In fact, in 1950 the town of Hempstead added over 40,000 new residents. The following year the number was 55,000. Population growth warranted government to step in and secure reliable commuter service to New York. In the late nineteenth century, the LIRR spurred development of the island. Both passenger and freight service provided speedier travel over the former stagecoach and sea vessel. However, the railroad’s original design served as a link in an all-rail route to Boston, Massachusetts. Chartered in 1834, the plan established a railroad from the Brooklyn waterfront to Greenport where it would connect with a ferry bound for Stonington, Connecticut and the Old Colony Railroad to Boston. Since the existing Brooklyn & Jamaica Railroad was absorbed into the system, construction of what is now the LIRR began at Jamaica and moved eastward. Since it called for a direct route, the railroad’s main line traversed the central, unpopulated section of the island. To serve the more populated areas of the North and South Shores, branch roads needed to be built. Since it didn’t have the capital, standard practice of the day was to organize a company for the sole purpose of building a rail line. Building companies could sell bonds or stock to fund expenditures and investors were later reimbursed by the LIRR. After a new branch was completed it was leased or sold to the LIRR. The method allowed the railroad to add lines and equipment without direct public assistance. Constructed in several phases, the Port Jefferson branched from the main line at Hicksville and continued along the North Shore communities of Syosset, Cold Spring Harbor, Huntington, Greenlawn, Northport, Kings Park, Smithtown, St. James, Stony Brook, Setauket, and Port Jefferson. Initial construction terminated at Northport in April 1868. However, the decision to expand to Port Jefferson seemed inevitable since it was the chief shipbuilding harbor on Long Island during the Industrial Revolution. Groundbreaking for the branch by the Smithtown & Port Jefferson Railroad building company was early May 1872 and the last rail was spiked on November 18. Passenger steam service began on January 13, 1873 and the branch was later incorporated into the LIRR. As it began to serve other areas of the island, the LIRR faced competition. One of the biggest threats was the South Side Railroad’s Jamaica to Patchogue right-of-way running along the South Shore parallel to the LIRR’s main line. The Long Island responded by constructing a branch from Eastport to Sag Harbor to prevent the South Side from moving eastward. Two other competitors were the Flushing & North Side Railroad from Long Island City to Whitestone, financed in large part by Conrad Poppenhusen, and the Central Railroad of Long Island from Flushing to Babylon, built by A.T. Stewart, founder of Garden City. Known as the Stewart Line, the Central connected with the Flushing & North Side in 1872, creating a rail link from the East River to Babylon. Poppenhusen later took over both the South Side and Stewart lines forming a system as large as the LIRR. However, railroads found it difficult to compete with each other and sought ways to consolidate. Poppenhusen took over the Long Island in 1876, creating the unified system in operation today, retaining the name LIRR. Although Poppenhusen soon went bankrupt the railroad carried on, going into receivership and under control of Austin Corbin. Under Corbin’s leadership the old South Side right-of-way was connected to the LIRR at Eastport, creating one line running along the South Shore from the East River to Sag Harbor. A turning point in Long Island’s development came in 1900 when the LIRR received permission to establish a terminal in Manhattan. Since this required crossing the East River, a bridge or tunnel needed to be built. Meanwhile, the Pennsylvania Railroad (PRR) also received permission to construct a Manhattan station and connect to it via a Hudson River crossing. Since the Long Island had no funds for bridge or tunnel construction, LIRR President William Baldwin sought help from the financially-sound PRR. A deal was reached whereby the PRR constructed both sets of tunnels and the Manhattan terminal in exchange for LIRR ownership. Following years of construction, LIRR trains finally ran to Pennsylvania (Penn) Station via the East River tunnels on September 10, 1910. 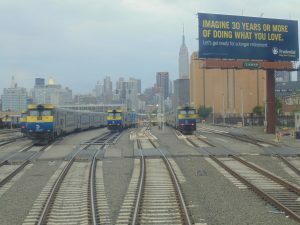 Under PRR ownership, LIRR improvements included direct access to Manhattan and rail electrification as far east as Mineola on the main line. A Long Island building boom was expected but the onset of the First World War halted development. New communities came along after the war in the 1920s. At this time, LIRR service and ridership was at a peak. Although it served primarily commuter traffic to and from Manhattan, the railroad also provided service to summer destinations along both the North and South shores as wealthy New York merchants sought escape from city life. However, the Stock Market Crash of 1929 and the Great Depression put a damper on both the island and the railroad. No money was available for community development and rail improvements. The automobile also replaced the iron horse as the dominant means of travel, altering the LIRR’s role as the primary choice of transportation. Another factor affecting the railroad directly was the construction of the Independent Subway to Jamaica in 1937 which took away close to eighty percent of Queens’ ridership. On February 2, 1949, the PRR declared the LIRR bankrupt. The fiscal predicament emerged during Long Island’s post-war suburban development. Home building escalated and the population skyrocketed. For example, in the twenty-nine year period from 1930 to 1959, Suffolk’s population quadrupled from 161,055 to 586,651. Like other American railroads, the Long Island was in need of new equipment. As a private endeavor, its rate of return was not high enough to borrow money. The PRR was also in economic trouble and was of no substantial help. Safety concerns following two tragic accidents in 1950 forced state government to step in. The first disaster occurred in Rockville Centre on February 17 when two trains collided head-on, claiming over thirty lives. Over seventy perished nine months later when an express train rear-ended a local on the same track in Richmond Hill on November 22. In response, the State Legislature created the Long Island Transit Authority to heed that the LIRR provided safe and adequate service. Although not a governing body, the Long Island Transit Authority beckoned transition. On August 12, 1954, following more than five years of bankruptcy, the LIRR embarked on a twelve-year, $65 million rehabilitation program headed by former PRR official Thomas M. Goodfellow, who later became LIRR president. Funds came from a variety of sources: a twenty percent fare increase, a state-approved fifty percent real estate tax decrease, and a $5,500,000 PRR grant. Within two years, hundreds of new cars were purchased and many older cars were modernized. Additionally, diesel locomotion replaced steam in all non-electrified territory by 1955. During the twelve-year plan, the LIRR also centralized operations to provide better service. Beginning in 1956, running time of many trains were shortened by shifting express freight shipments, formerly handled on four daytime trains, to the late-night and early-morning. The action saved commuters anywhere from twenty-three to forty-three minutes. System-wide it shed forty-eight hours of scheduled running time. Finalization of revisions took over a year and hoisted the railroad into position as the nation’s fastest means of commuter travel in 1958. Although improvements were made to LIRR service in the twelve-year plan more needed to be done. By 1965 about a sixth of scheduled trains on any given day were late and a dozen or more were cancelled for lack of equipment. When the rehabilitation program neared completion, New York State Governor Nelson Rockefeller called for the LIRR to be modernized. William J. Ronan, a former aide to the governor, was asked to head a five-man committee which later recommended that New York purchase the LIRR and act as a supervisory body. In response, the state formally acquired the railroad from the PRR on January 1, 1966. With Ronan as chairman, the Metropolitan Commuter Transportation Authority (MCTA) was chartered to oversee operation. The LIRR’s former management was to remain as well as President Goodfellow. Immediately, the MCTA set out to extend electric rail into non-electrified territory. Since diesel locomotives could not travel to Penn Station in light of exhaust fumes, electric trains provided a one-seat ride to Manhattan. Financed with a voter-approved $2.5 billion bond, electric rail was completed from Mineola to Hicksville and onward to Huntington on the Port Jefferson branch by 1970. Concurrently, a fleet of “Metropolitan” high-speed electric cars was purchased from the Budd Company. The new cars allowed for faster speed and quicker boarding times. Since the cars did not have steps to grade level, high-level platforms were constructed at all stations. The four-foot-high platform sped travel time since passengers could board and exit trains at door level. Initially, the new Metropolitan cars were plagued by mechanical issues and required extensive repairs, delaying their installment. Railroad managers from the private-sector days were very critical of the cars, further compunding progress. The situation culminated in a dire deterioration of service in 1969. During one ten-day period in the summer months about 635,000 commuters were affected by trains that were more than ten minutes late and 140,000 whose trains were cancelled. State auditors were called in and found serious lapses in LIRR management. Issues ranged from work crews disappearing before noon to trainmen getting off a train before the end of a shift. Auditors concluded that the LIRR lost money and needed more supervision as a public entity. In time, problems with the Budd cars were corrected and the state authority guided the railroad to break free of poor management. By 1974, all 770 Metropolitan cars were in service and a new scheduling system was in place. The concept was based on commuter zones whereby express trains stopped only at designated stations to and from Manhattan, permitting a faster commute. The modernization project was successful. In the end, the railroad provided a better commute on the Port Jefferson branch to Huntington. There were more trains, better run times, and consistent off-peak service. More importantly, there was more direct service to Manhattan, eliminating the need to change to electric trains. For rush-hour passengers, there were now six roundtrips to and from Huntington and New York, some running relatively express. Faced with similar postwar issues, national railroads merged in order to provide centralized management. The consolidation movement started in the 1950s and culminated with the 1968 merger of the two largest American railroads, the Pennsylvania Railroad and the New York Central. By this time, both were in dire straits. The Pennsylvania accumulated $304 million of deferred maintenance by 1964 and downsized to avoid purchasing new equipment. The Central was in a similar situation. Each railroad reached the point of no return as revenues fell and operating costs rose. Ultimately, the combined Penn Central Railroad went bankrupt on June 20, 1970. The collapse of Penn Central signaled that federal intervention was imperative. First, the 1971 Amtrak law created a quasi-public corporation that gained control of American passenger operations. Although not forced to, railroads joined Amtrak if they wished. If they did not, they had to continue train operation until January 1, 1975. To join Amtrak, a railroad contributed a sum of money calculated from passenger losses for the year 1969. Second, the Regional Rail Reorganization Act of 1973 created a nonprofit, federally-chartered corporation which financed a new railroad, later known as Conrail. Prior to its downfall, the Penn Central was doing more freight tonnage than in previous years. However, it did not possess the funds to manage operations and improve infrastructure. Conrail’s aim was to consolidate freight and improve the national railroad system. The LIRR is an important topic in railroad study because it was the first to successfully exhibit what government ownership accomplished. Within two years of the MCTA’s formation, Governor Rockefeller sanctioned an “umbrella-like state transportation agency” that expanded the MCTA and gave it control of the New York City Transit Authority and the Triborough Bridge and Tunnel Authority. To initiate the transition, the State Legislature passed new amendments to the state’s public authorities’ law creating a Metropolitan Transportation District with the Metropolitan Transportation Authority (MTA) to be in charge. The new state authority controlled greater New York’s transportation network and provided funding for improvements. While not identical to the New York State effort, Amtrak and Conrail were federal bids to repair and consolidate the rail industry. As the MTA improved the LIRR system, similarly, federal funding modernized the national system. Essentially, the MTA set an example of the benefits of state control and what public funding could produce. Private enterprise alone could not repair the American railroad system. Following electric service to Huntington, the MTA sought further improvements. The first push to expand beyond Huntington began in 1973 when Governor Rockefeller offered a $3.5 billion bond proposal for transit and highway improvements. However, the state was unable to sell bonds for the project and it was shelved. Meanwhile, LIRR ridership began showing signs of improvement as the 1970s progressed, especially in light of high gas prices. Annual ridership was 80,841,000 passengers in 1980, a four-and-a-half percent increase from 1979. It marked the seventh straight year of growth and the largest ridership since 1950. The most rapid surge in ridership was on the Port Jefferson branch. It increased forty percent between 1973 and 1980. In fact, by 1983, it accounted for 25,000 passengers of the 109,200 rush-hour total. Pressure mounted for electric service and the preferred one-seat ride to and from Port Jefferson. In the summer of 1984, the MTA included electrification within a five-year $588 million package of LIRR improvements. However, by 1986 plans were postponed indefinitely in light of a $90 million budget gap. To satisfy the demand for the one-seat ride, a cost-effective substitute called for development of special engines capable of both diesel power and third-rail locomotion. Costing an estimated $3 million each, the dual-mode locomotive could switch off its diesel engine and utilize electric power to Manhattan providing passengers in non-electrified territory a one-seat ride without changing trains. Beginning in 1994, a two-year pilot program tested ten cars and three dual-mode locomotives on the Port Jefferson branch during rush-hour. 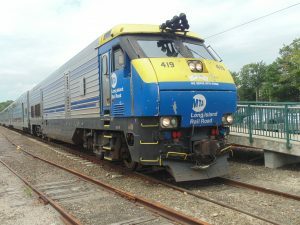 Satisfied with test results, the MTA approved the purchase of a new diesel fleet. The locomotives were specially-built for the LIRR since rail officials wanted engines capable of accelerating as quick as electric trains. Half of the forty-six new locomotives would have the dual-mode ability while the other half would be strictly diesel locomotion. The new fleet was unveiled on the Port Jefferson branch on October 21, 1998, a year-and-a-half behind schedule. The first engines in service were strictly diesel locomotives. From the start, the fleet was problematic. The first issues were coach doors opening at inopportune moments and glitches in the train’s braking system. Secondly, inspectors discovered cracks in the frames of locomotives. Lastly, air horn noise triggered complaints from residents living along the railroad’s right-of-way. When dual-mode service was instituted more serious situations arose. On October 23, 2000, fire engulfed a dual-mode locomotive, marking the third time in two months that the new equipment was disabled because of fires triggered by electrical problems. Of the forty-six locomotives, three were now out of commission. Five months later, there were fourteen out of service and another twenty-six operating with “in-service” defects. In September of 2002, they were shipped one by one to Norfolk Southern in Altoona, Pennsylvania, to receive structural and mechanical fixes under warranty from their manufacturer, Electro Motive Division (EMD) of General Motors. However, engine maintenance concerns continued. In the summer of 2007, LIRR President Helena Williams hired former Metro-North Railroad head Donald Nelson to conduct a comprehensive review. In his report, Nelson called the LIRR’s diesel engines a “repair headache” and recommended they be replaced. The dual-modes broke down, on average, every 14,595 miles, more than twice the 30,000 miles projected. Referring to them as lemons, Nelson noted that the new engines failed twice as often as predicted. To complicate repair issues further, EMD shut down and the warranty on most parts expired. This left the LIRR with troubled trains unlike any others in the world. New Fleet a Bad Investment? Although there were reportedly no funds available in the 1980s, branch electrification may have been beneficial in the long run. A 1983 study estimated the cost of electric rails to both Northport and Ronkonkoma on the main line at $146 million. Twenty-one years later, electrification to Port Jefferson according to a 2004 estimate was $10 million per mile. Not taking inflation into account and the cost of new electric cars, the cost to electrify the roughly twenty-three mile branch would have been about $250 million in 2004 compared to well under $100 million in the 1980s. In total, the purchase of the substitute fleet, including construction of high-level platforms and other necessary improvements system-wide, was estimated in 2000 at $500 million. No doubt the LIRR has spent millions in repair costs and manpower since that time. Branch electrification may also have been warranted because renovated rail systems historically attract ridership. Between 1990 and 2000, suburban rail increased twenty-six percent nationally due to investment in new and expanded rail systems. In the New York area, the number soared to thirty-one percent from 1995 to 2000. After the introduction of the new diesel fleet, 1.9 million more passengers rode the LIRR in 1999 than the previous year, for a total of 82.2 million riders. In fact, ridership grew nine percent in the preceding ten years, since only 75.4 million rode the LIRR in 1989. It can be argued that branch electrification may have attracted new ridership. Upon completion of main line electrification to Ronkonkoma in 1988, the daily number of riders on the branch jumped from 6,800 to 12,000. 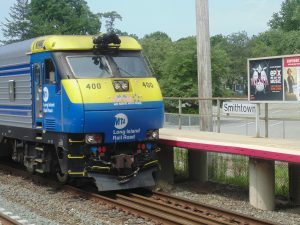 In theory, the LIRR may have tacked on new riders with electric service to Port Jefferson. The history of the LIRR demonstrates that public supervision set railroads on the right track. 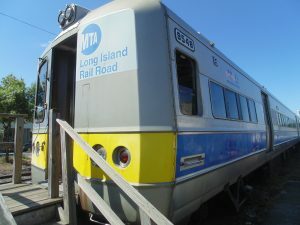 The rail infrastructure spearheaded by the MTA in the 1960s and 1970s modernized the LIRR and provided the best commuter service along the Port Jefferson branch to Huntington. Subsequently, late twentieth century rail improvements did not rejuvenate service because the new diesel fleet was not an acceptable substitute for electrification. Dual-mode technology was supposed to end the moniker “change at Jamaica” [for electric service] by the end of the twentieth century. To this day, it has not. 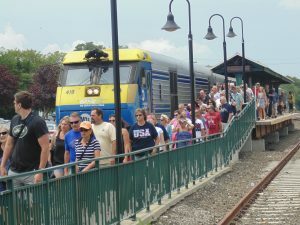 Only a few select rush-hour trains to and from Port Jefferson provide the desired one-seat ride. All other service requires a train change. While revised maintenance practices have stabilized service, the present fleet of locomotives and coaches still fell far short of expectations. Growth in Port Jefferson ridership necessitated the best, most convenient access to Penn Station. By selecting the dual-mode alternative, the railroad created a maintenance headache that will no doubt continue to trouble service. Today, two state-sponsored projects are underway to improve rail service and infrastructure. The first is East Side Access, envisioned to bring LIRR trains to Grand Central Station on Manhattan’s East Side. Originally scheduled for completion in the 2000s at a cost of $4.3 billion, the price tag is now $10.2 billion with trains set to run by December 2022. Cost overruns and budgetary matters of contention have delayed progress. In early 2016, an agreement needed to be reached between city and state officials to avoid fund depletion. The other project, still in early planning stages, is construction of an additional Main Line track between Floral Park and Hicksville. Third track construction, averaged at $1 billion, would work in conjunction with East Side Access to allow for more trains to and from the island. However, it is also plagued with controversy. While the plan is backed by state officials and a consortium called Right Track for Long Island Coalition, communities along the route have vied to fight. Hempstead Town Supervisor Anthony Santino raised concerns about a danger to children since the ten-mile right-of-way runs adjacent to recreation centers and playgrounds. 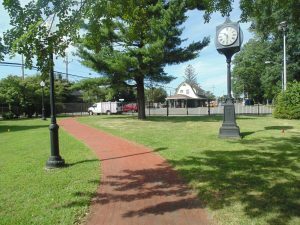 Floral Park Mayor Thomas Tweedy criticized the project for its lack of a detailed budget. Both projects, although massive and costly, attempt to create a better Long Island infrastructure. While they have potential to modernize travel and improve life on the island, their future may be in jeopardy due to short-sightedness and lack of preparation or vision. Hopefully, successful completion of these or other publicly-funded projects will once again rejuvenate the system and set the LIRR on the right track. Richard Saunders, Main Lines: Rebirth of the North American Railroads, 1970-2002 (DeKalb: Northern Illinois University Press, 2003), 22-24. Edward J. Smits, Nassau, Suburbia, United States America: The First Seventy-Five Years of Nassau County (New York: Friends of the Nassau County Museum, 1974), 195-197. Henry Isham Hazelton, The Boroughs of Brooklyn and Queens, Counties of Nassau and Suffolk, Long Island, New York 1609-1924 (New York: Lewis Historical, 1925), 389. “LIRR/Tracking Long Island’s History/Ride into History with the Long Island Rail Road, New York Newsday (Combined Editions), April 19, 1998. Publisher not identified, 1959), 10-11. Vincent F. Seyfried, The Long Island Rail Road: a Comprehensive History, vol. 3, Age of Expansion (Garden City, NY: Vincent F. Seyfried, 1984), 50. Ron Ziel and George H. Foster, Steel Rails to the Sunrise (New York: Duell, Sloan and Pearce, 1965), 36. Main Line to the Mainland, 11-12. “Electrification to Mineola,” Long Islander (Huntington), October 15, 1926. Main Line to the Mainland, 12-14. “L.I.R.R. Envisions Big Improvements following the War,” New York Times, May 6, 1943. Tom Morris, “Triumph and Blunder and Disaster Have Climbed aboard the LIRR,” New York Newsday, June 19, 1983. John J. Scala, Diesels of the Sunrise Trail (Mineola, NY: Weekend Chief Pub., 1984), 27. John Pascal, “Homes Grow Faster than Trees,” Long Island: America’s Most Complete Community 1, no. 1 (January 1960): 51. “5th Major Wreck in the U.S. in 1950: Two of the Disasters Occurred on the Long Island in the Last Nine Months,” New York Times, November 23, 1950. “Death Toll Lifted to 78 in L.I. Crash: To Advice Commission,” New York Times, November 29, 1950. “Dewey Signs Bills to Revive L.I. Road,” New York Times, April 1, 1951. Scala, Diesels of the Sunrise Trail, 33. “LIRR Completes Two Years of Progress,” New York Newsday, August 8, 1956. “L.I. 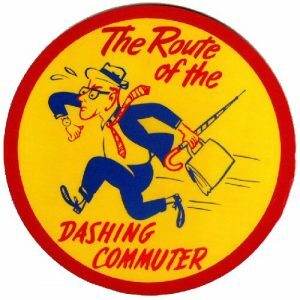 Rail Road to Speed Runs to Eastern Suffolk,” The Watchman (Mattituck), December 13, 1956; Dave Kahn, “LIRR Cuts Times, Rushes Non-Rush Trains,” New York Newsday, August 28, 1958. Stuart Dim, “LIRR Panel Seeking More Spark,” New York Newsday, June 30, 1965. Mal Karman, “Those Who Wait for LIRR also Serve (Late Dinners): Lest We Forget the Commuter’s Wife,” New York Newsday, August 20, 1969. Martin Flusser, Jr., “LIRR Tries to Divide and Conquer Inequities,” New York Newsday, January 7, 1972. Christopher M. Cook and Howard Crook, “LIRR Revamps its Schedules; Adds Trains on Most Branches,” New York Newsday, June 18, 1972; Emanuel Perlmutter, “L.I.R.R Improving Service on all Lines under a New Timetable,” New York Times, June 18, 1972. Andrew J. Sparberg, From a Nickel to a Token: the Journey from Board of Transportation to MTA (New York: Empire State Editions, an imprint of Fordham University Press, 2015), 160-161; Harvey Aronsen, “Why They Deride the LIRR,” New York Newsday, January 25, 1969. Special to the New York Times, “Main Transit-Road Plans,” New York Times, July 27, 1973. Edward C. Burks, “LIRR Trains, Nice but Late,” New York Times, March 21, 1976. John T. McQuiston, “L.I.R.R Keeps Adding Commuters,” New York Times, July 26, 1981. John T. McQuiston, “L.I.R.R Shifts Trains to Meet Rush-Hour Rise,” New York Times, August 5, 1984. John T. McQuiston, “Pulling the Plug on Electrification,” New York Times, November 25, 1985. John T. McQuiston, “L.I.R.R Electrification: New Delays, News Plans,” New York Times, February 23, 1986. Eric Schmitt, “L.I.R.R May Add Double-Decker Cars,” New York Times, September 21, 1988. John T. McQuiston, “New Coaches for L.I.R.R Will Have Two Levels,” New York Times, March 11, 1995. Sidney C. Schaer, “LIRR Report Card Improves/New Train Boots Commuter Rating,” New York Newsday (Nassau and Suffolk Edition), October 20, 2000. Sidney C. Schaer, “LIRR: Cracks Found in New Locomotives,” New York Newsday, May 18, 2000. Sidney C. Schaer, “Fire Fears for LIRR Engines,” New York Newsday (Combined Editions), October 25, 2000. John Valenti, “LIRR Fleet Heads for the Shop/46 New Locomotives Need Repairs for Cracks,” New York Newsday (Nassau and Suffolk Edition), June 21, 2001. Joie Tyrrell, “LIRR Destination: Pa. for Fixes,” New York Newsday (Nassau and Suffolk Edition), October 2, 2002. Steve Ritea, “LIRR Report: Room for Improvement,” New York Newsday (Combined Editions), October 3, 2007. Steve Ritea, “LIRR’s Diesel Trains Pose Delay Dilemma Railroad Pressing Options for its Fleet of GM Custom-made Locomotives that are Prone to Breakdowns,” New York Newsday (Combined Editions), December 2, 2007. Gwen Young and Dennis Hevesi, “3 Stations Studied for LIRR Hit List, New York Newsday, March 29, 1983. Joie Tyrrell, “Big Plans on Track / East Side Access, More New Cars, a Third Main Line Track; These and Other Moves are Part of a Proposed Multibillion-dollar Expansion,” New York Newsday, March 17, 2004. Steven Kreytak, “Smooth Quiet Ride: LIRR Unveils New Fleet,” New York Newsday (Combined Editions), October 22, 1998. Pucher, John, “Renaissance of public transport in the United States?,” Transportation Quarterly 56, no.1(Winter 2002): 38. Hugo Kugiya, “LIRR’s Ridership Rose in 1999,” New York Newsday (Nassau and Suffolk Edition), January 20, 2000. Bill Bleyer, “Bruce McIver’s Track Record: a Mixed Bag Animosity Despite Successes,” New York Newsday (Nassau and Suffolk Edition), July 30, 1989. Edward C. Burks, “Change at Jamaica: A Turbine-Powered Train.” New York Times, June 20, 1976. Alfonso A. Castillo, “$10B East Side Access Project Falling further behind Schedule,” New York Newsday (Combined Editions), July 2, 2016. Emma G. Fitzsimmons, “M.T.A. Spending Plan Restores Funding for 2nd Ave. Subway,” New York Times, April 20, 2016. Alfonso A. Castillo, “Report: LIRR to Weigh Third Track Impact on Parking, Air quality,” New York Newsday (Combined Editions), August 30, 2016. Alfonso A. Castillo, “Hempstead Town Supervisor Raises Concerns on LIRR 3rd Track,” New York Newsday (Combined Editions), August 30, 2016.